Erma Johnson Hadley, the chancellor of Tarrant County College, died Thursday morning after a battle with pancreatic cancer. She was widely known and highly regarded for her work in education, and in the community. “After a lengthy and brave battle with cancer our leader and friend, Tarrant County College Chancellor Erma Johnson Hadley passed away this morning,” the school said in a release. Several military veterans spent Thursday learning to operate computerized equipment that machines metal parts. They are Tarrant County College students at an Opportunity Center. They never met their school’s chancellor. But they’re part of her legacy, and one of the reasons for Erma Johnson Hadley’s ever-present smile and infectious optimism. “The last two governors — no, the last three — all knew her by first name,” said long-time friend and TCC trustee Gwendolyn Morrison. Hadley was among TCC’s founding faculty in 1968, and became chancellor in 2010. Morrison says Erma Johnson Hadley grew the system and enrollment through programs like five early college high schools, and a dozen opportunity centers, where students get vocational training. “Twelve opportunity centers around the county, that she negotiated dollar-a-year contracts for,” Morrison said. Morrison said Hadley could negotiate those sweet deals because she was so respected. She had chaired the county hospital board and DFW Airport board, earned national recognition, and never strayed from herself. “She’s still a member of the same church that she was a member of when she came here,” Morrison said. TCC cited Hadley’s work for record enrollment numbers and success of its students. Erma Johnson Hadley, the chancellor of Tarrant County College, died Thursday morning after a battle with pancreatic cancer. News 8’s Jim Douglas has more on the legacy she left behind. “Because of Chancellor Hadley’s vision and leadership, TCC is poised for continued student achievement and success while expanding access to education for residents of all ages,” the college said. A couple weeks ago, when she knew her death was nearing, Erma Johnson Hadley gave a thumbs up when she learned the school’s new virtual campus had been accredited. She had pushed hard for it. Angela Robinson, who has served as TCC’s vice chancellor for administration and general counsel, will take over Hadley’s responsibilities until the board meets. Robinson said the chancellor’s 12-member leadership team is up to the challenge. Hadley rose from desperate poverty to break through barriers of race and gender. She died peacefully Thursday morning at the age of 73, surrounded by loved ones. A wake was scheduled for Oct. 9 at 5 p.m. at Mount Rose Baptist Church in Fort Worth. The funeral was set to be held on Oct. 10 at 1 p.m. A location had not been determined Thursday afternoon. 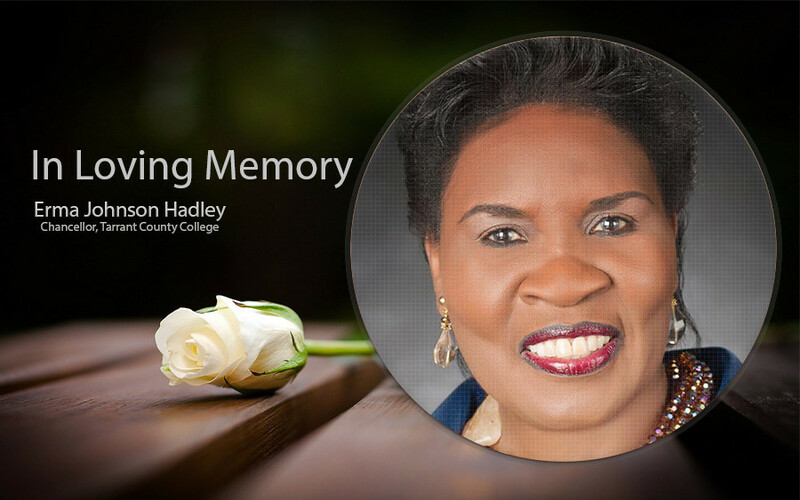 In lieu of flowers, the family asked for donations to the Erma Johnson Hadley Scholarship Fund. Those donations can be made at any Chase Bank.